A shake up and modernisation of approach to ecommerce has given Stoves Are Us a future-proof solution. 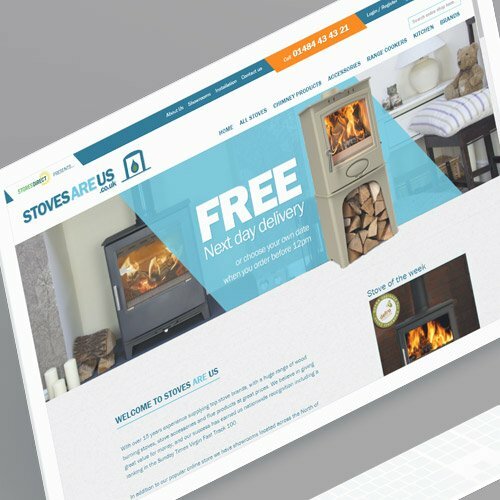 Stoves Are Us, part of the Stores Direct Group, are a Huddersfield-based retailer providing stoves, cookers, chimneys, wood burners and more. Well-regarded in their field, Stoves Are Us sell across the UK thanks to their successful ecommerce platform, which supports their installation services and local showroom. Despite their previous success, Stoves Are Us were determined to continue to develop their offering, in order to continue competing with their competitors. Ecommerce is one area of web design that seems to develop faster than any other, with standards always changing. The ecommerce site was overdue for a redesign that had a modern look, with a focus on usability for customers. We began by considering a user’s journey through the site. On the original Stoves Are Us site, customers were asked to select from different heat outputs, which was a bit too technical, and assumed too much knowledge from their customers – would a first-time buyer really know about heat outputs? Probably not. So, instead, we focused on different categories that were easier to understand and visualise. 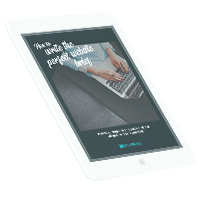 Room size, product style and budget ranges are now the top-level categories that customers can choose between, mirroring questions they are likely to ask a salesperson in store. This route means the site can solve problems for users who don’t know what they want, rather than assuming they have already chosen a solution and just need a place to buy it from. The aim for the design was intended to match the simpler and more straightforward user journey, with a bold, simple and minimalist design that put the focus on the Stoves Are Us products, with clear calls to action directing users towards various tools that would help them make their decision. The site is built in Magento, a secure and flexible ecommerce platform. We built the new front-end, leaving the store tools that the Stoves team used in place. We also developed a number of bespoke quote tools for flues, using technical drawings and in-depth forms to ensure quotes were as accurate as possible. 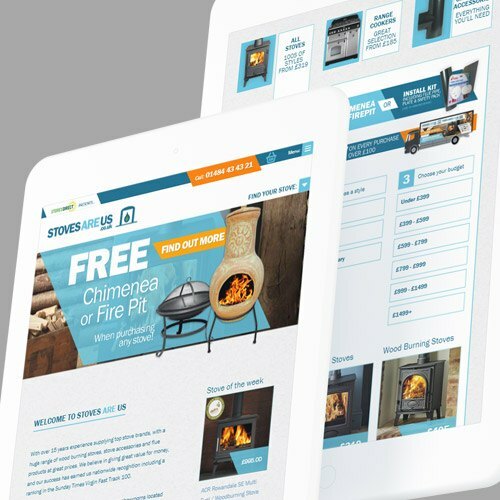 The site’s design and build was also used for Fireplaces Are Us, another member of the Stores Direct Group, creating a stronger online identity for the brand as a whole. We continue to work with the Stoves team regularly, supporting them with the day-to-day demands of running a successful ecommerce business. We’re excited to see what the future holds. We’ve used Splitpixel for two Magneto re-designs of our existing sites and then subsequently for further front and back-end enhancements. We’ve also used them for separate design tasks including truck livery and trade show stands design. They have a strong design team that brought us a fresh and cohesive design and they are also backed by a sound technical team with a great can-do attitude. They’re a good company to deal with, you know where you stand and they deliver what they promise.